In the article below, body language expert Janine Driver explains how to make elevator rides less awkward. Imagine riding on a crowded elevator; perhaps you are running late to work, or maybe you are going to a doctor’s appointment, or perhaps you are on your way home to pick up your two-year old son from Day Care. Now picture yourself standing in the back left corner, facing the doors. There are two people to your right, and five people in front of you — each of you just inches from one another and not saying a word. All of a sudden the 19th floor button lights up above the closed metal doors, less than a second later, the doors open to two young men eating Chimmy Changas, talking loudly, and making wild gestures. Then the unimaginable happens, the newcomers squeeze in and continue their conversation as if they are at a Red Sox game. 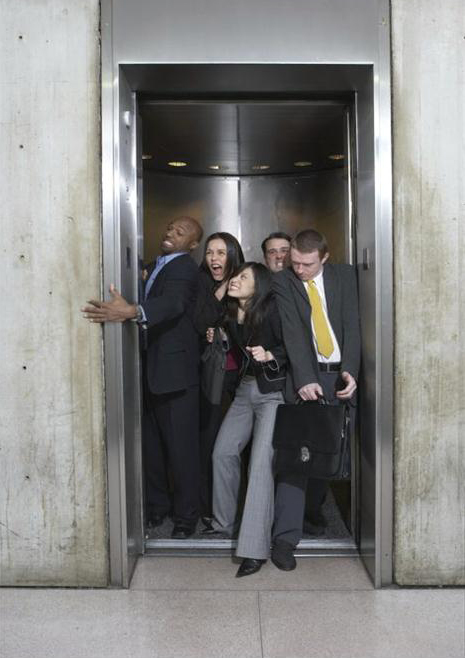 With over 120 billion rides per year in over 600,000 elevators in the U.S., you might be surprised to learn that there are still some people who are not familiar with the unspoken code of elevator etiquette! Yes, even on elevators there are invisible physical boundaries to observe. Just like a head nod, a smile, and a wave hello, space “speaks.” The study of “perception and use of space” with humans is called Proxemics and it applies to us everywhere, especially in tight spaces – like in an elevator! Upon entering the elevator, you should stand as close to a wall or corner as possible, this will help you and others distance yourselves from one another with a hearty buffer zone. When it comes to body language, you can reduce a spacial invasion if you eliminate large body movements, decrease eye contact and lower your tone and pitch of voice. The more people that enter the elevator, the more your body language should get smaller. If you are going to a high floor, it will save everyone from sighing and bumping into each other if you just stand in the back. And if you are on one of the lower floors, please stand toward the front. Generally, most people on an elevator are in self-talk mode; thinking about their day or perhaps planning for tomorrow. They tend to gaze at the ground, the button panel, the closed doors, or they may quietly look at something they are holding in their hands. While avoiding visual contact is a means of avoiding interactions, women and men approach the issue of eye contact in this 4 x 4 boxed-in space differently. Men prefer to have no eye-contact with anyone inside the elevator, while the ladies need to know who they will be sharing this small space with, so they’ll give a quick glance and maybe even flash the giant of all gestures — a smile. Any time you’re talking on an elevator, take a moment for a reality check! Are you talking quietly or can the people on the outside of the elevator still hear you? Are you dropping F-bombs or talking about a private issue? Are you picking up on the negative non-verbal cues the other people are sending you (bending away from you, wrinkled noses, rolling eyes)? Do other people seem to be enjoying your story about your husband busting you cheating on him with his best friend or would they rather you take the 5th amendment? Seriously, for the most part, conversations in the elevator are generally not recommended. But if you are the type of person that likes to talk to strangers in line at the grocery store and you must chat with people in the elevator, then keep the topic simple and light, i.e. I love your coat, your earrings are beautiful, or how about those Yankees? Yes, you now have the tools to make your next elevator journey a little more quieter and safer for our saniety! For more tips and information from Janine Driver visit Lyin’ Tamer. See this link to read the original article and view the accompanying video.